apartment probably won't be anywhere near as spacious as your parents' home. Whether you're moving into a studio, one bedroom or sharing an apartment with roommates, here are a few space-saving ideas you might want to look into when designing your new digs. A great way to conserve space is to find a bed that doubles as something else. While the term "Murphy bed" at first may make you cringe, there are actually a number of stylish options out there you might want to check out. Take the Cabrio In bed, for instance, available at www.bonbon.co.uk, it is the perfect combination of a bed and a desk. If you are looking for cool furniture on a budget, take a look at the loft beds and day beds at http://www.ikea.com/us/. Of course, you can also consider a futon which doubles as a sofa and a bed http://www.target.com. When you're finally done with all that studying, just pull down your bed and get some rest. options out there to help avoid that morning backache. The Doc sofa for example, available at www.bonbon.co.uk transforms a comfy couch into a bunk bed. Ikea offers a pull out bed that fits under their day bed http://www.ikea.com/us/. Your guests will not only be impressed by your hospitality but your furniture as well. 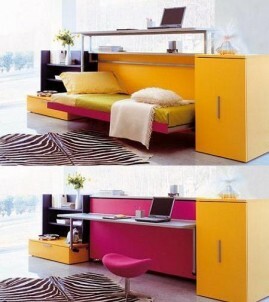 Another way to save space is by finding an expandable table. There are coffee tables out there that open up and can fit as many as six table settings. Chances are your apartment isn't big enough for a living room and dining room. Serving as an everyday coffee table, you can also host the occasional dinner party and not have to worry about someone not having a place to sit.